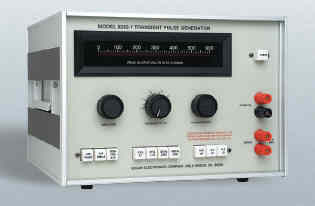 The Solar Model 2654-2 Lightning Generator synthesizes electrical impulses needed for testing susceptibility to transients induced in aircraft equipment by lightning strikes. 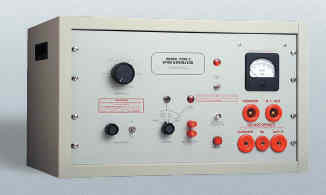 The high voltage power supply is controlled by means of a knob on the front panel of this module. This continuously variable supply is capable of delivering over 1100 volts DC, and it can source in excess of 25 amperes of current for rapidly recharging capacitors between pulses. The output of the high voltage supply is also controlled by a “modulator” circuit which ensures that the first and succeeding pulses in multi-stroke sequences are delivered at the proper levels. 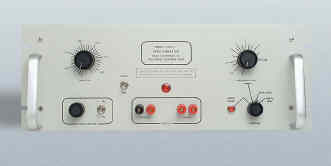 The Modulator is controlled by the system microprocessor. intervals for 5 or 10 minutes. pre-set or vary waveform amplitudes during testing. • LCD displays for transient selection and peak voltage. • Visual and aural annunciators. • Multiple-stroke and multiple-burst sequences precisely controlled by a microprocessor. • Uniform or pseudo-random pulse spacing. 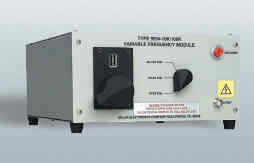 • Continuously variable high voltage power supply (0-1000 volts). Required in all systems, this module manages control functions and delivers low-voltage system power. Using a backplane similar to those found in computer designs, it determines which modules are present and allows the user to select waveforms and determine if they will be delivered as single strokes, multiple strokes, or, in the case of waveforms 3a and 3b, multiple bursts. The rise and fill times of each waveform are determined by components in each generator module. The pulse-to-pulse timing of each waveform is tightly controlled by a microprocessor. This allows	multiple-stroke and multiple-burst events to be delivered with either uniform or pseudo-random	pulse spacing. The microprocessor also provides visual and aural cues for the operator about the status of the system. induced in aircraft equipment by lightning strikes. • Internal, low ESR/ESL energy storage. 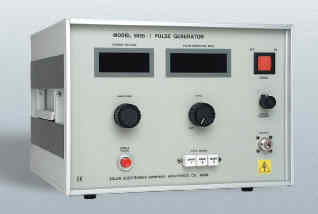 • Clean pulses produced by reliable high-voltage, high-current solid-state devices. • LED indicators for Module-Selected and Pulse-Initiated conditions. • Low impedance output compatible with pin, induction, and ground coupling devices. • Single-stroke and multiple-stroke capability. • Low impedance output compatible with pin, ground, and induction coupling devices. • Single-stroke, multiple-stroke, and multiple-burst capability. • Low impedance output compatible with pin and ground injection coupling. * SS = Single Stroke, MS = Multiple Stroke, MB = Multiple Burst. ** RTCA/DO-160E, Section 22 transients 1 and 4 are generated using the same module. The remaining transients are produced by separate modules. 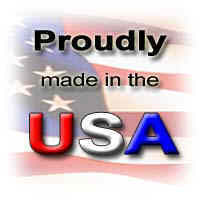 Designed to meet the requirements of MIL-STD-461E test method CS116. Also capable of limited testing for RTCA DO-160E section 22 (Single Stroke to level 4) when used with the appropriate coupling device. Generator provides six fixed frequency damped sinusoidal waveforms as specified in MIL-STD-461E pulse three double exponential waveforms for RTCA DO-160E. Step Frequency Module Type 2154-500K/50K provides the nine frequencies available for DEF STD 59-41 testing. 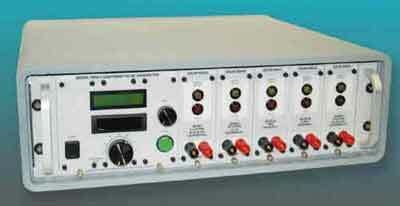 Generator provides 35 nanosecond pulse required for test method CS115 of MIL-STD-461E. 17 of RTCA DO-160E when used in conjunction with Type 2201-1 Impedance Matching Pulse Transformer. 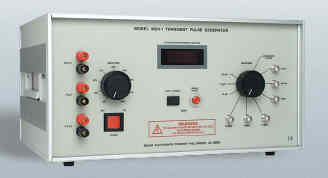 Transient generator for Test Method CS06 of MIL-STD-461C.